Exodus: Gods + Kings = Boring! As Moses, Christian Bale is no Charlton Heston – and as good a filmmaker as he is, Ridley Scott is no Cecil B. DeMille. Despite some pretty impressive practical and CG effects and cinematographer Dariusz Wolski, Exodus: Gods and Kings is a two-and-a-half hour slog. Scott has paced the film a couple notches below deliberate – even the action sequences seem half hearted. There are a couple of interesting bits – the parting of the Red Sea is achieved in a fresh and imaginative way, and the approach to embodying God in the film is considerably different from other filmic takes – though not much different from the way he was portrayed in the brilliant two-season wonder Joan of Arcadia. The film starts in the middle of Moses’ story and we are given the first part in a very non-cinematic way – Scott usually knows better. The rule is ‘show, don’t tell’ – and he has not done that. Then there are the Biblical plagues – they strike without warning, at least until about halfway through. Even then, it’s not Moses delivering the warning in person but in hieroglyphs written (in blood?) on a horse’s flank. The only warning delivered in person is for the final plague – and Moses delivers it, despite Ramses’ order for him to be killed, because the Pharaoh’s soldiers respect Moses and let him walk right into Ramses’ palace. And speaking of Ramses, I don’t know if it is so stated in any stage directions included in the script, but surely Scott didn’t instruct Joel Edgerton (a usually fine actor) to play Ramses like a petulant, spoiled ten-year who’s struggling not to let the adults see him being petulant. Even at his angriest (and friendliest) Ramses is essentially played with that one not – just at varying degrees of volume. People were walking out of the screening I attended – and this was an ‘enhanced presentation’ screenings with the bigger screens and posher sound systems (here they’re called AVX) and, of course, in 3D (which was pretty good but nothing extra-special), so you know they paid considerably more to get in in the first place. By the time the end credits rolled, my drink was long gone and I was nodding off just a tad bit (indeed, the best part of the screening was the trailer for Kinsman: The Secret Service). For all its flaws (Noah as action hero!) Noah was a vastly superior Biblical epic. 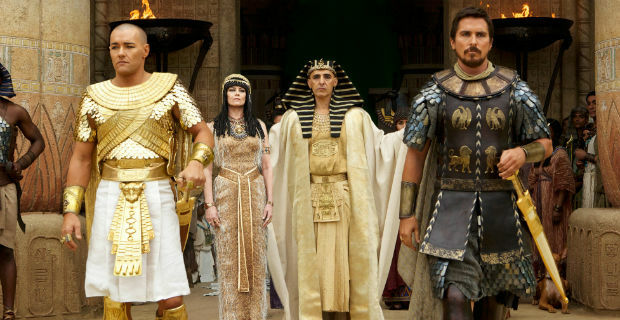 Exodus: Gods and Kings was merely big and loud. Previous PostMichelle says Birdman Starts Strong but Stumbles Across The Finish LineNext PostTop Five: Chris Rock Rocks It!